This page contains one Review from Kunyu academy in 2018 December. 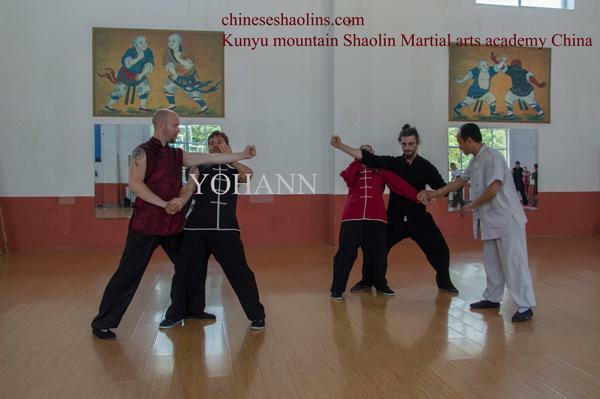 Yohann is on the left of photo learning traditional Wing chun on mountain. Firstly, in 2013 I wanted to find a way in my life to learn kung fu at full time without being professional or work in it. I did researches and it was nearly impossible in my country. After that, I dreamed that i could do it in China, and I found it was possible in some kung fu's schools. I live my life for 5 years checking evolution on my project, reading and viewing all contents about different schools, and finally I choose Kunyu Mountain. Why ? I think it's because of the environment, for me China is an emergent country with lot of pollution and too much dynamic cities, Kunyu Shan is in the mountain and make a cut with China's cities, so it could help to have less distractions to the training. Masters had good reviews, and the price was good for me, also when i began to take contact with the school, they responded to me fast with comforted me to be well accompanied my project, and in my training. My year at Kunyu made me gain lot of things, and lot more I don't see now. I gain lot of experience and skills in martial arts, but I mainly gained a new way to work on it, a new vision about what it is, how we can improve in it, and how we can help other people to be good at it. I'm not the best martial artist in the world, sometimes I think i'm under the average level and I struggle a lot, but here I saw a lot of people like me, and seeing us step up together was really great. I think I had a good philosophy about the training, and the life in the school before coming here, but I have to say that being with coach Loc pushed me to an other level. He tried as much possible to make me train more, and keep the motivation to do it, he managed to motivate me to do things I wouldn't do in normal time like sparring and competition, and I regret nothing of theses. Having good students as friends helped me a lot to focus in training too, because they motivated me to train even if sometimes I wanted to be lazy, and they were also good to keep my mind fine by doing other things than kung fu. With the rythm of the training, and I did overtraining, every friday I was like "Already the end of the week", and for every grading "Already one month", the time goes so fast, and i'm glad about this, there is no time to lose. For me the training was cool and balanced, body and mind, it's only possible to follow it when you give your day and your week to do it, but for me it's the only real way to improve your martial arts skills. Masters are well-minded men, sometimes joking, sometimes rude, but every time trying to help me in my training, or my life, they care a lot about us and if we are good or not. I have to say that even the staff have the will to help, I'm not very good at speaking english and I don't really do efforts about my accent, but they always gave me time to understand what I had to say, even if it was confuse for me too. I specially want to thank Master Guo, and coach Loc, for all these day spend together, and all the things they shared to me. I want to thank Shifu Sun, and Shifu Sui for being so much good persons, they weren't my teachers, but their smiles or words sometimes made me feel good. I should thank all the translator for their work and their caring about the students, but I have to say that i'm really thanks full for Daisy and Maggie who helped me the more by their time and their behavior. The surroundings of the academy are good if you like the nature, I could walk in a quiet place and just enjoying the view and the moment. I don't like big cities but sometimes it's good to take a break from the academy atmosphere, and Yantai was good for this, I tried lot of new food it was like being in the western world in some points, it helped me to wash my mind lot of times, and come back to the training with a new motivation. Thank you for this year ! Yohann practised Application of Baji Chuan.